UPDATE 7.20am: CREWS took a 55-year-old man to hospital this morning 12 hours after he was bitten by a shark off the Capricorn Coast. Paramedics met the patient at Rosslyn Bay Harbour when his boat arrived around 7am and treated him for a shark bite to his shoulder. Senior operations supervisor in Rockhampton, Brad Miers said the man was fishing at Swain Reefs around 5pm yesterday when he was bitten by the shark. "The man stated he caught a large reef shark and as he went to pull it on board, it turned and bit him on the upper arm," Mr Miers said. Shark Bite: Senior operations manager of Rockhampon QAS, Brad Meyers explains the incident this morning. Crews reported the man was in "remarkable condition" and "joyful" despite his injury. A shark with a jaw diametre of 10cm was likely to have bitten him. Crews transported the man to Rockhampton Hospital. 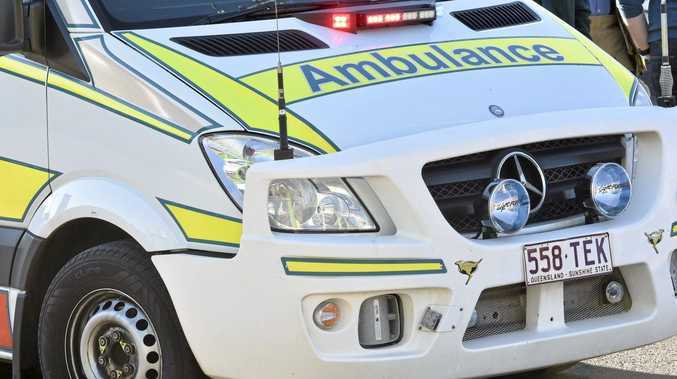 BREAKING: PARAMEDICS have been called to treat a man on the Capricorn Coast who has reportedly been bitten by a shark. Queensland Ambulance Service received the call around 6.30am and headed to Rosslyn Bay Harbour to meet the patient in his boat when it arrives back in the harbour. The 65-year-old man was reportedly bitten on the shoulder sometime yesterday afternoon and suffered a deep cut "down to the bone".